Training Blog, just the important things. I have been lucky enough to work my dogs gathering in Nidderdale this year. This has included gathering the moor above Angram reservoir. Here is a variety of films, and slideshows. I apologize for the footage, I will take better next year. Although it was a fine day, it was very windy. It was also quite physically challenging up there. If you want to see a particular photo from the slideshows, click on the small pictures underneath each slideshow to get to that album. Enjoy. Gathering Lodge moor involves some of the young men being dropped off at Kettlewell and walking fourteen miles back to Nidderdale collecting sheep on the way. Others make their way up to the top of the moor from the Nidderdale side, and take up various positions. 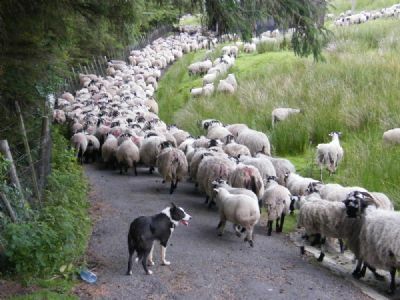 Each person covers an area to drive the sheep in the right direction, using their dogs. The sheep are clever at hiding and try to make their way back up to the top. The rough terrain hides them. One minute, you can see them, then they hide. 1000 ewes and lambs are normally gathered and driven down to the handling pens at the bottom of the reservoirs. The October gather was misty, less than half the sheep were seen on the gather, requiring a second gather the following week. Gathering the moor above Angram and driving the Cheviots down the valley to the home pastures for clipping (Summer).